Alkalinity is a measure of the total amount of sodium bicarbonate (HCO3-) and carbonate (CO32-) in water. It is reported in milligrams per liter (mg/L), or parts per million (ppm) as calcium carbonate (mg/l CaCO3). If alkalinity is low, use lime or dolomite at 30-50 kilogram/1600 m2 one time every 2 or 3 days until the pH of water reaches the required levels. Alkalinity is a pH buffer that provides CO2 for photosynthesis in algae and plants in water. When alkalinity is high, the pH is more stable and less changeable. 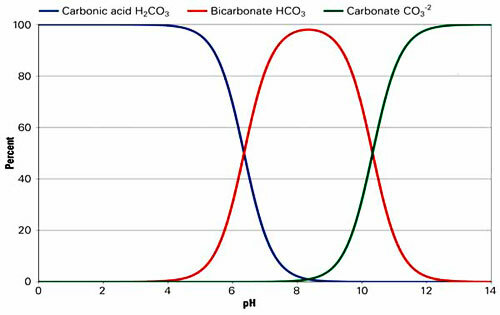 When the pH is below 8.3, alkalinity is present mostly as bicarbonate (HCO3-).